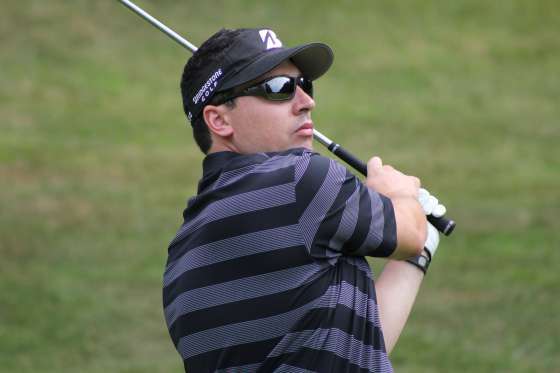 BOYNE FALLS – Classic car insurance salesman Korey Mahoney of Manton admitted he didn’t have much of an explanation for the classic 8-under 64 he shot on the Alpine course at Boyne Mountain Resort to win the 25th Tournament of Champions Wednesday. “Somehow I was able to put it together,” said the 32-year-old former mini-tour golfer who grew up in East Lansing, won the 2002 Michigan Amateur championship as an 18-year-old and played college golf at Eastern Michigan University before embarking on a six-year stint as a touring professional that ended in 2012. The 64, one off his personal best tournament round, left him at 12-under 204 for the championship, four shots clear of Eric Lilleboe, a mini-tour golfer from Okemos who closed with a 69 for 208. It earned the father of two the $8,000 first-place check from the $55,000 purse, and the symbolic green jacket that comes with a lifetime membership at the Country Club of Boyne in Harbor Springs. Two-time champion Andy Ruthkoski of Muskegon, who shot 67, Michigan Open champion Jeff Bronkema of Wayland, who shot 69, and senior pro Brian Cairns of Fox Hills Learning Center in Plymouth, who shot 69, tied for third at 207. The Cuzzort brothers, Jeff and Steve from Grosse Ile, each shot 71 and tied at 210 with Portage amateur Jim Troy, who shot 67 to close. Jim Dieters of Midland Country Club (70), second-round leader John Seltzer of Blythefield near Grand Rapids (74), Kyle Martin of Lochmoor in Grosse Pointe Woods, and New Mexico pro and five-time champion Jeff Roth (74) tied at 212. Former LPGA player Elaine Crosby of Jackson, who shot 73 for 213 and a tie for 13th, was the top finisher among the women, and Evan Bowser of Dearborn, who shot 69 for 214 and 17th, was the low amateur. The unique tournament brings together men, women, professionals, amateurs, seniors and juniors who have won recognized championships in Michigan, and they play from four different tee positions for one title. Mahoney, in for his life as a former Michigan Amateur champion, had one of the best starts of his golfing life. He birdied holes 3 and 4 before shaping a 4-iron shot to 20-feet on the par 5 No. 5 hole and making the eagle putt. Then he had a tap-in putt on No. 6. In the end, with birdies at 11 and 12 early in the back nine, he counted eight birdies and the eagle against two bogeys. He made a bogey from the front fringe on the par 3 No. 17 hole, but then crushed a drive 348 yards on the par 5 No. 18 hole and didn’t hesitate in hitting a 4-iron second shot on to the green and eight feet from the flag from 239 yards out. He two-putted for his final birdie. Mahoney launched into the early lead and said he really didn’t feel nerves through the day. Runner-up Lilleboe said the bunched scoreboard at the start of the day with 15 golfers within five shots made it possible for someone to do what Mahoney pulled off. Mahoney said he would be back at work Thursday, and that he would take advantage of the Country Club of Boyne membership.